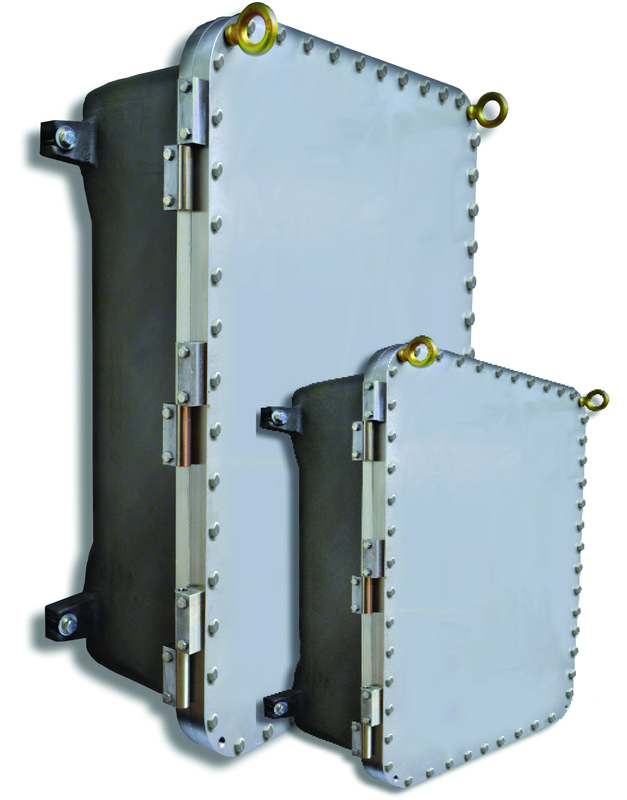 Designed for use in highly corrosive areas, the new cast stainless steel explosionproof enclosures provide the perfect construction material for offshore, petrochem, or volatile industrial areas where environmental conditions require additional corrosion protection. The XCESX series of cast stainless steel explosionproof enclosures provide an alternative to traditional cast aluminum explosionproof enclosures which may become compromised or could break down over time in highly corrosive areas. Rated for Class I, Division 1 / Zone 1 hazardous locations, the XCESX enclosure series carries UL, cUL, ATEX, and IECEx approvals for global applications. Five standard sizes make up the initial offering from internal dimensions of 10”W x 14”H x 8”D up to 24”W x 36”H x 10”D. Features include a watertight gasket and stainless steel cover bolts for Type 4X / IP66 ratings, stainless steel hinge kit, mounting panel, removable lifting eye bolts, cover alignment device, cast-on mounting lugs, and internal / external ground screws. A flat plate cover allows for additional working area for viewing windows and operating devices such as pushbuttons, selector switches, and pilot lights.